Premature babies – are we doing the right thing? A Deakin University law academic has questioned if we are doing the right thing by saving the lives of extremely premature babies. 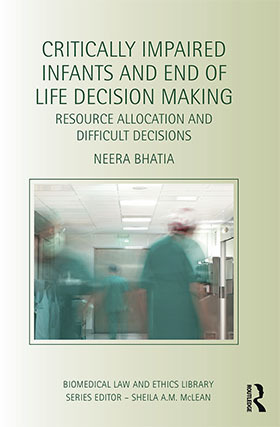 In a new book based on research conducted for her PhD, Deakin Law School academic Dr Neera Bhatia explores the legal and ethical issues surrounding decisions to withdraw or withhold life-sustaining treatment for babies born on the edge of viability (23 weeks) and addresses the controversial question, are some lives too expensive to treat? “Just because we can save these babies born at 23 weeks, does it mean we should, knowing that finite public resources could be spent on other patients, children and even babies born at a later gestational period and are likely to make a greater health improvement?” Dr Bhatia asked. “The main premise of my book is that the allocation of finite healthcare resources should be a serious consideration in end of life decision making for this select group of patients. With an ageing population and limited healthcare funds these difficult questions need to be asked and answered. Despite rapid advancements in technology and medical science allowing extremely premature babies to be ‘saved’ from death they are still overwhelmingly subject to severe disability, Dr Bhatia explained. “We are able to save babies from death but not yet from disability,” Dr Bhatia said. Dr Bhatia understands that talk about withdrawing or withholding live-sustaining treatment is a very polarising issue, especially when children are involved. However, she believes that we need to start an open and honest discussion on this topic. “These are hard and very uncomfortable discussions to have but necessary. In western developed countries such as the UK and Australia medical practitioners are now able to keep extremely premature babies alive, but unfortunately cannot protect them from disability and lifelong poor health outcomes and the ongoing costs and impact on the families caring for these children,” Dr Bhatia said. “Some will disagree with my contention, some will agree and others will say they share the same opinion but would never say it out loud – perhaps this is to be expected given that talking about putting a ‘price’ or ‘value’ on life is so taboo in society. “But the reality remains that end of life decisions need to be made in some circumstances and should be made on more rational grounds by attempting to put some of the associated emotion aside. What I am suggesting, and it is a suggestion, is that end of life decisions for impaired and extremely premature infants should be driven by a more objective, transparent and tangible approach. In this regard, resource allocation and quality of life should be important considerations. By starting a conversation on this contentious issue, Dr Bhatia hopes that eventually end of life decisions would not be such a shocking consideration when the issues do arise. “End of life decisions for critically impaired infants are generally made by consultation between doctors and the parents and in rare circumstances with the intervention of the courts. However more open discussion about how finite resources are allocated and the corresponding quality of life for extremely premature babies would potentially lead to more sound policies and decisions that also have the interests of wider society in mind,” Dr Bhatia said. ‘Critically Impaired Infants and End of Life Decision Making – Resource Allocation and Difficult Decisions’, is published by Routledge Cavendish and available now.